The destroyers' transit on Monday took place as officials in Washington and Beijing negotiated trade talks. China has lashed out at the United States in the wake of another "freedom of navigation" exercise conducted by the U.S. Navy in the South China Sea, accusing Washington of undermining "peace" and "security". 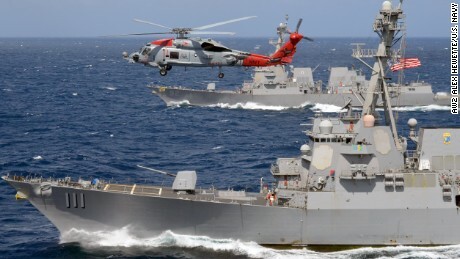 The USS Spruance and USS Preble sailed within 12 nautical miles of the Spratly Islands as part of what the US Navy calls a "freedom of navigation operation", CNN reported. The objective was "to challenge excessive maritime claims and preserve access to the waterways", as well as to show that the United States "will fly, sail, and operate wherever global law allows", Cmdr. China and the United States have repeatedly traded barbs in the past over what Washington says is Beijing's militarization of the South China Sea by building military installations on artificial islands and reefs. Shortly after that operation, China accused the U.S. of trespassing in its territorial waters - and said it had deployed missiles "capable of targeting medium and large ships".